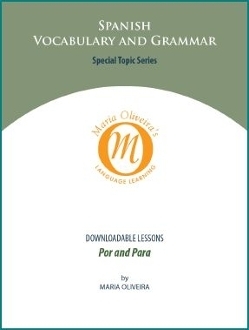 Are you puzzled by the various uses of por and para? They both mean “for,” but which preposition is the correct word to use? This downloadable lesson presents clearly stated examples of proper usage for these prepositions. Study the rules and idioms, then use the exercises to practice what you have learned. Develop your Spanish language skills with this focused study of a challenging subject. INSTANT DOWNLOAD! No waiting, no shipping and handling. After purchasing this lesson watch your email for your access link which we will send you. This link will be available for 2 days (48 hours), and you will have 3 attempts to complete the download.